Battery and solar powered, this optic comes with a circle dot reticle and a quick detach (QD) mounting system. 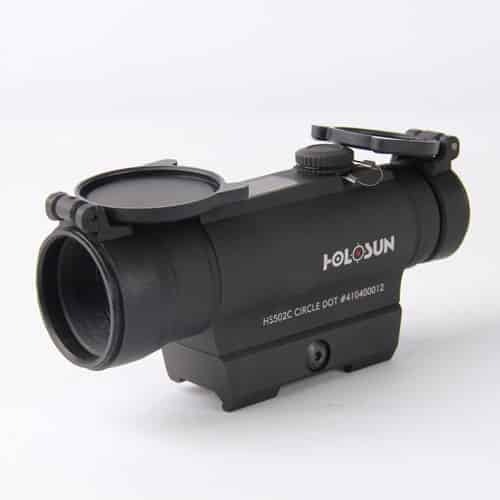 The HS502C is a 30 mm Tube Red Dot optic with a dual reticle option. The operator can switch from a 2 MOA dot to a 65 MOA circle dot with a push of a button. Highly efficient light emitting diodes and solar panels allow Holosun solar optics to run without a battery in many lighting conditions. Additionally, the back-up battery lasts up to 5-years on the dot and up to 2 years on the circle dot.